Plan ahead this year. Rather than carving your pumpkin for Halloween, leave it intact so they can be stored, whole for later use or cut and preserved by freezing or canning. Pumpkin is an excellent source of vitamin A and fiber. One-half cup contains 40 calories. Along with pie for the holidays, the flesh can be cubed, mashed or pureed and served as a side dish, added to soups, stews, quick bread, muffins and cookies. Look for pumpkins true to type in size, shape, and color, with thick flesh and heavy for size. Rind should be clean and hard. Avoid pumpkins that are misshapen, have scars or blemishes and are light weight for their size. Pumpkins should be harvested before the first frost. Wipe and polish them with a soft cloth. Leave 1” of stem attached. Cure for 10 days in an area that is 80-85 degrees F. This hardens the rinds and heals the surface cuts. Pumpkins can be stored at 50-60 degrees F for 10 weeks on more on shelves in a single layer so air can circulate around them. Such areas might include a dry basement, heated garage, or closets that adjoin an outside wall. To dry, carefully wash pumpkin seeds to remove the clinging fibrous pumpkin tissue. Pumpkin seeds can be dried in a dehydrator at 115 -120 degrees F for 1 to 2 hours, or in an oven on warm for 3 to 4 hours. Stir them frequently to avoid scorching. After drying, to roast, toss with oil and/or salt, place on a baking sheet and place in a preheated oven at 250 degrees for 10 to 15 minutes. 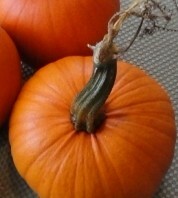 Select full colored mature pumpkin. Cut or break into fairly uniform pieces. Remove seeds. Steam until tender or bake at 350 degrees F. Cool, then scoop pulp from rind and mash. Pack in moisture vapor proof container leaving a 1/2 inch headspace for pints with wide openings, and 1 inch for quarts allowing for expansion. Label, date containers and freeze. This should maintain high quality for 8-12 months. Home canning is NOT recommended for pumpkin butter or any mashed or pureed pumpkin. Produce needed per quart jar: 1-1/2 to 3 pounds of pumpkin or 15 pounds per 7 quart canner. Select full colored mature pumpkin. Wash, remove seeds and peel. Cut into 1” cubes. Add just enough water to cover, boil for 2 minutes. Caution: Do not mash or puree. Fill jars with cubes and cooking liquids leaving 1” headspace. Adjust lids and process in pressure canner, pints 55 minutes at 10 pounds (weighted gauge) or 11 pounds (dial gauge) and quarts for 90 minutes at 10 pounds (weighted gauge) or 11 pounds (dial gauge). Note: For making pies, drain jars and strain or sieve cubes. For recipes and more tips on preserving pumpkin, visit the National Center for Home Food Preservation. Adapted from So Easy to Preserve (2014) Cooperative Extension, University of Georgia, and “Pumpkins” (2007) by Joanne Austin, retired WSU Extension Faculty, Skagit County.